India's education technology startup 'Dost Education' has bagged a $25,000 Next Billion Edtech Prize 2019 along with two other winners from Tanzania and Egypt. Ubongo (Tanzania) and PraxiLabs (Egypt) were the other two winners. Dost Education was awarded for its ability to empower parents to take charge of their child's early education by creating short, friendly audio content that is sent to them via their mobile phones. The software, audio content, and tool kits of Dost Education makes it easy fun and addictive for parents to boost their child's early development, so low-income families need no longer send their children to primary school behind and without a chance to catch up. 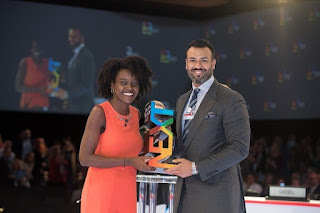 Next Billion Edtech Prize is awarded by the UK-based Varkey Foundation. The award recognises the most innovative technology destined to have a radical impact on education in low income and emerging world countries. The award also highlights technology's potential to tackle the problems that have proven too difficult for successive generations of politicians to solve. Q. Which Indian education technology startup has bagged the $25,000 Next Billion Edtech Prize 2019?